PowerVEG 420 Grow Light The name "420" references the area of the light spectrum produced by this lamp. The PowerVEG 420 is a true VEG light for indoor growers. 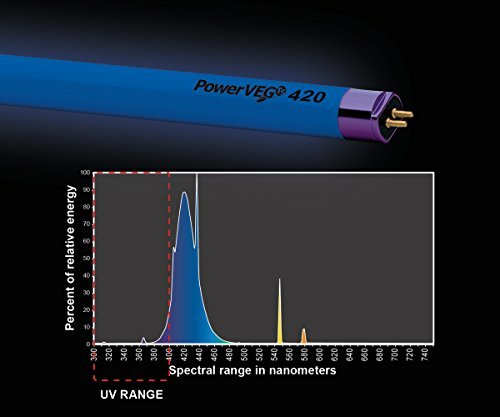 PowerVEG 420 provides a spectrum that is crucial for plant growth during the vegetation cycle, focusing all spectral energy at 420 nanometers. This high UV A spectrum adds the nutrient values that are vital for the growth. Combined with the spectrum provided by the FS+UV fluorescent grow lamps, the PowerVEG 420 maximizes the initial growth process for vegetation through: • Tighter internodal spacing • Stomatal opening 10 times greater than red light (feeding tube of plant) • Stronger root growth • Chlorophyll A • Lutein • Zeaxanthin • Beta carotene Spectrum Combinations for Your Plants The PowerVEG 420 can be combined with more than just Eye's FS+UV lamp. There are five total PowerVEG colors lamps that can be combined to make customizable light spectrums for your plants. Check out Eye Hortilux's main PowerVEG page for suggestions on color combinations. Directions The 420 can be used in any existing T5, 54 watt, HO (high output) lighting fixture. Combine the 420 with other PowerVEG T5's for maximum results. See Eye Hortilux's suggested formulas for VEG, FLOWER and START-to-FINISH. 420 Replacement Guide: Optimal Growth - 8-9 months Average Growth - 10-11 months Maintenance Growth - 11-12 months Based on 18 hour burn time per day Disclaimer: Product shown as fully lit. PowerVEG 420 appears white when not lit. If you have any questions about this product by Eye Hortilux, contact us by completing and submitting the form below. If you are looking for a specif part number, please include it with your message.